RGK superman with bra « Hercules and the umpire. May 2, 2014 at 9:17 am) suggested that I provide more behind-the-scenes accounts of what really goes in the federal trial courts. Believing that a picture is worth a thousand words, and keeping in mind my post on the wearing apparel of female lawyers, consider the following that I received last year (well before my apparel post) as part of a contest for the best Halloween costume. Costume, model and photo credit: United States Probation Office for the District of Nebraska (Halloween, 2013). 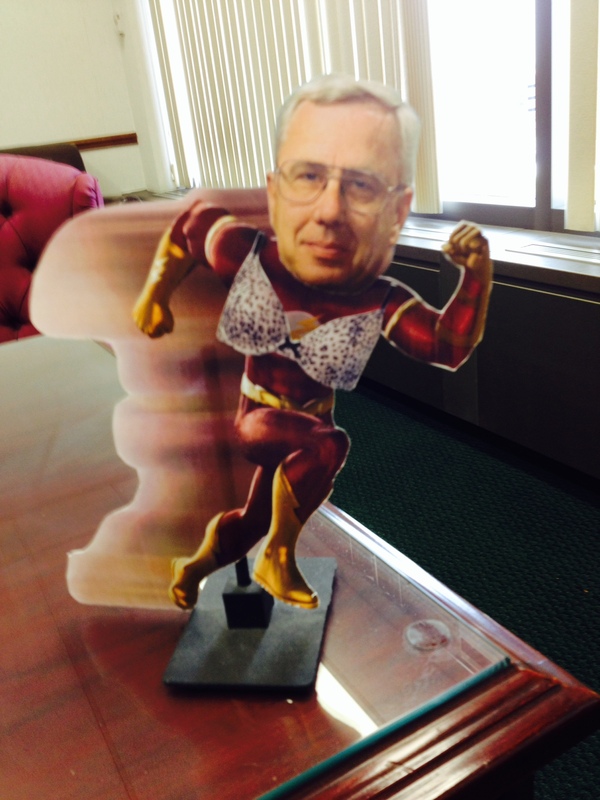 While I had nothing to do with this model or any awareness that my likeness would be used in the contest, the bra superimposed on the model by US Probation in 2013 is mine. How I came to wear that bra in open court in our Special Proceedings Courtroom long before my wearing apparel post or the 2013 Halloween contest is a behind-the-scenes story for another day (maybe). Yes, the United States District Court for the District of Nebraska has an annual Halloween contest. What’s more, Chief Judge Bill Riley of the United States Court of Appeals for the Eighth Circuit (whose office is in Omaha) is a very engaged participant as well. I think he might even have thought up the idea!